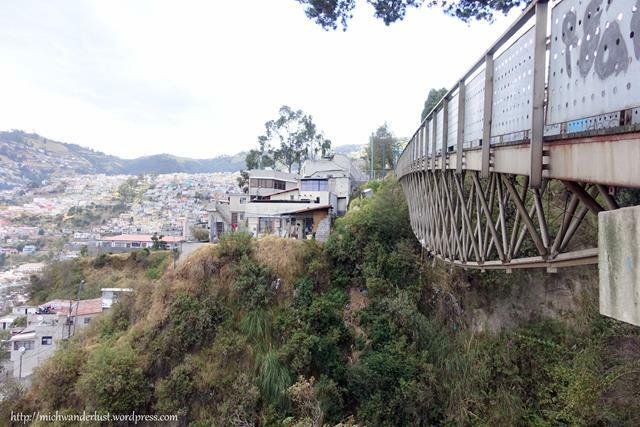 If you’re looking to get a real feel for Ecuador’s capital in as little time as possible, a Quito walking tour is the way to go. How do I know? 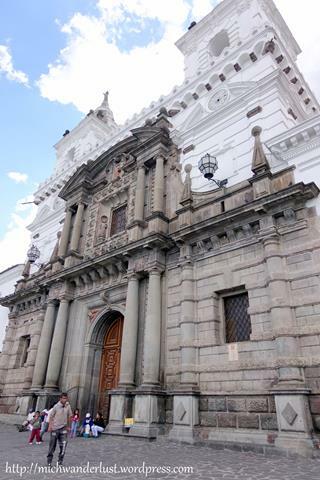 Well, for my final cultural excursion with Yanapuma Spanish School, we went on a walking tour through some of the neighbourhoods in Quito’s Old Town (Centro Historico) and I learned about some of the city’s fascinating history. I hadn’t noticed before, but next to the current street names (in green) you can see the former or historical name of that street in beige. 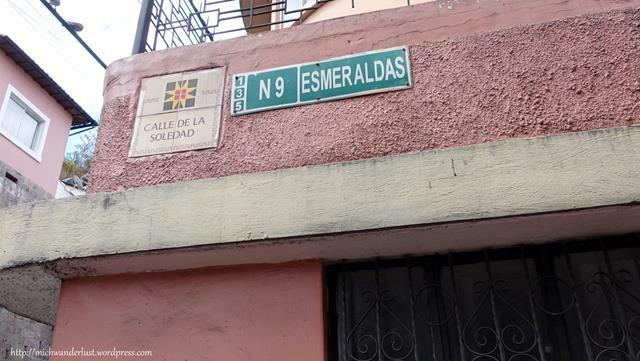 For example, the street called Esmeraldas used to be called Calle de La Soledad (Street of Solitude), because it was a relatively quiet road running perpendicular to the main streets. People used to go there to escape from the hustle and bustle, nurse a broken heart, write songs or poems, etc. 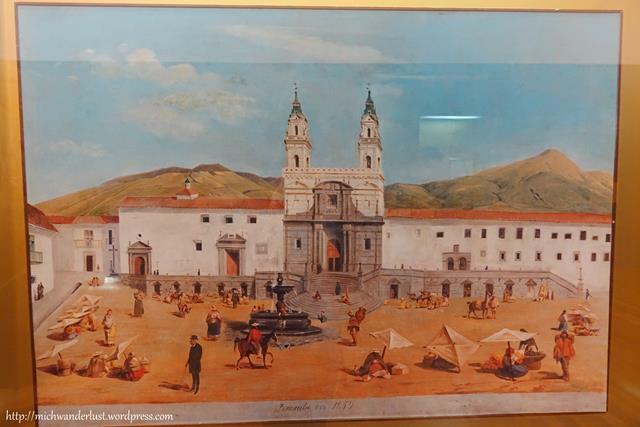 As you explore Quito’s old town, keep a look out for these old street names, and try to guess why they were given these names! As you head west on Esmeraldas, the road slopes upward. You’ll be rewarded for all the huffing and puffing with increasingly better views of the city. 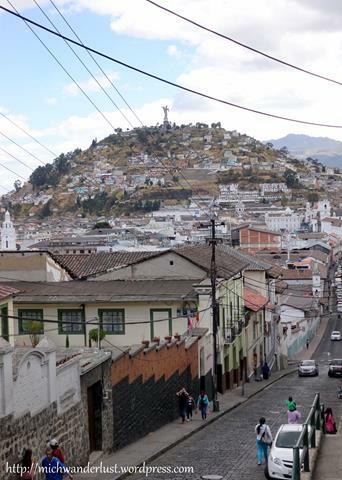 At the junction with Calle Cuenca (in the neighbourhood of San Juan), you can see El Panecillo in the distance. Following the road further west and upwards, you’ll reach the neighbourhood of La Chilena, which affords even better views. 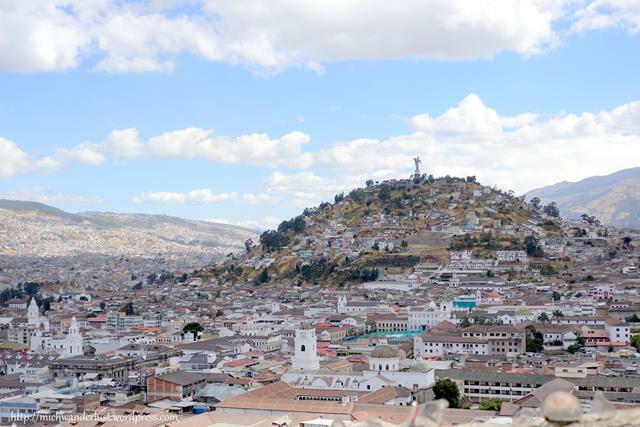 Apart from the unmistakable landmark of El Panecillo, from here you can also see other landmarks like the church called La Merced (the big white tower in the foreground) and a little further down, the church of San Francisco. There are two theories as to the origin of the neighbourhood’s name of La Chilena. The first (which seems more likely) is that it’s taken from the Kichwa word for wind or windy (because it’s windy up here). The second is that many years ago, there was a very beautiful Chilean girl who lived here. All the boys from around here would come to visit her. Hence, it was nicknamed La Chilena after her. There are two endings to this story: first, there was a particularly ardent admirer of the girl. He wanted to be with her so badly that he wouldn’t leave her alone. So to keep her safe, her family moved back to Chile. In the second ending, he killed her and the family moved back to Chile. Yikes… I don’t know about you, but I know which ending I prefer! All those red-roofed houses are from colonial times. 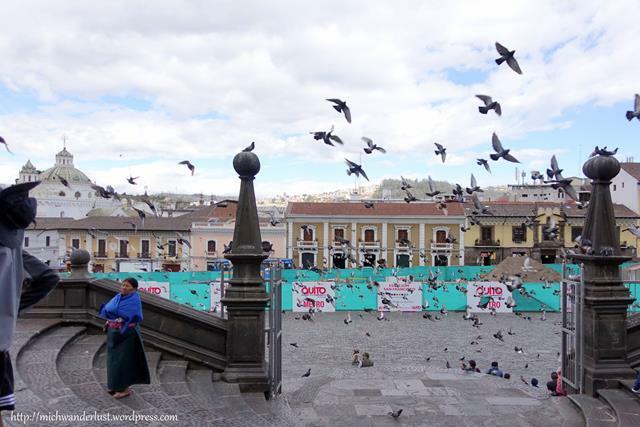 It’s quite fun to stand here and try to spot some of the major landmarks of Quito’s Old Town. 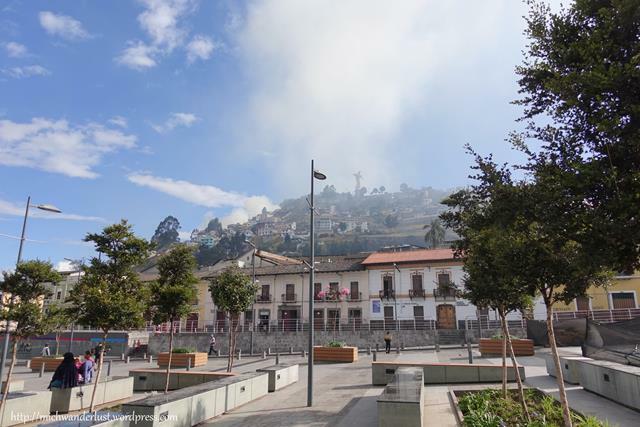 It’ll be a whole lot more fun if you do this exercise after you’ve been in Quito a few days. When you can spot places you’ve visited from this vantage point, you’ll be like, yeah, ask me for directions now! After that, we descended via this blue staircase (glad we didn’t attempt to go up via this route!). You can see a massive ravine underneath the bridge. 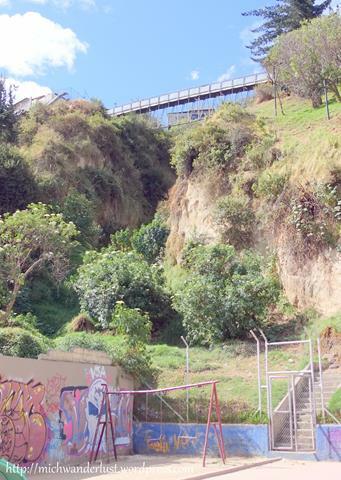 My teacher-guide explained that Quito used to be covered by these (this was one of the biggest), but they filled the ravines in order to build the city. No pictures from the inside because I wasn’t sure if it was permitted, but it was absolutely beautiful. 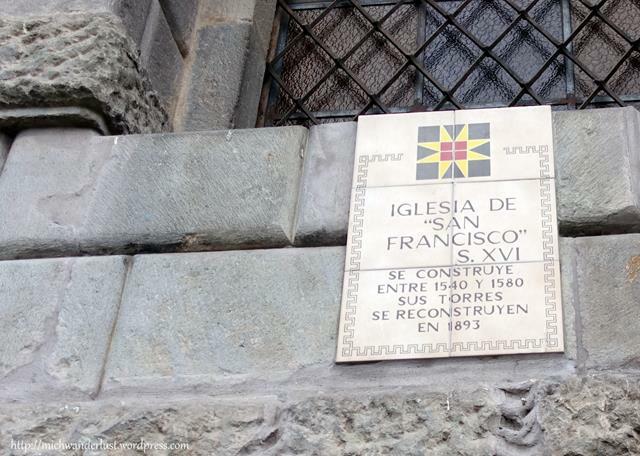 Not a huge amount of gold, so you know that it was probably a church for mestizos rather than Spaniards. But it was still very atmospheric with high ceilings and intricate carvings. There’s a sign near the door saying that (amongst others) coches are not permitted inside. I’ve learnt that coche is car, so it was quite puzzling, until my teacher-guide explained that here coches refers to prams. 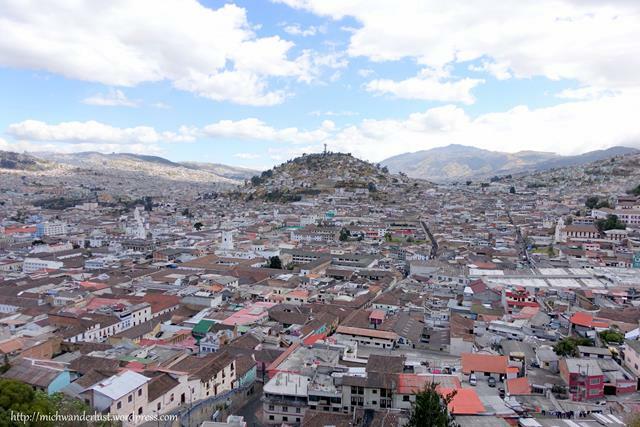 In Ecuador, cars are carros or autos. So don’t get mixed up and ask for a pram when you really mean a car! 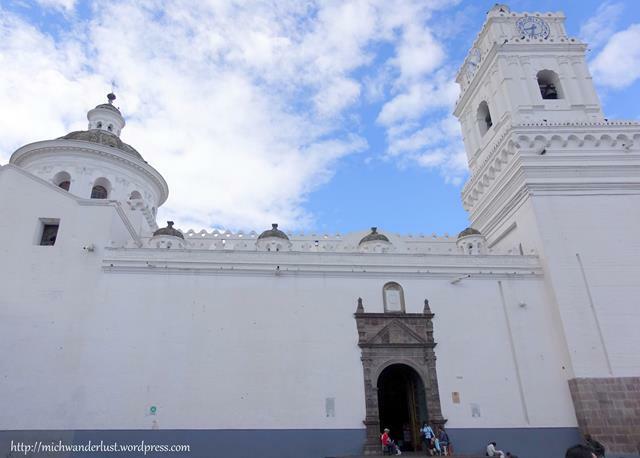 One of Quito’s most iconic churches, this one comes with a supernatural legend. As you can see, much of this church has been rebuilt over the years due to earthquake damage, including the towers. Now, about that legend. An indigenous builder was tasked with building the church in one day (whaaat?!). So, he predictably sold his soul to the devil in exchange for his help. The deal was struck on the condition that the church had to be completed before the rooster crowed the next morning. However, our builder was pretty smart. He secretly hid one of the bricks, and thus the church was never completed. And so, he got out of the bargain. Currently, the plaza in front of the church is taken up by construction – they’re building a subway system! I think that’s great. There are also a ton of pigeons here. Every now and then they would all start flying in a great circle around the plaza, as you can see above. Afterwards I realised there was a man feeding them. 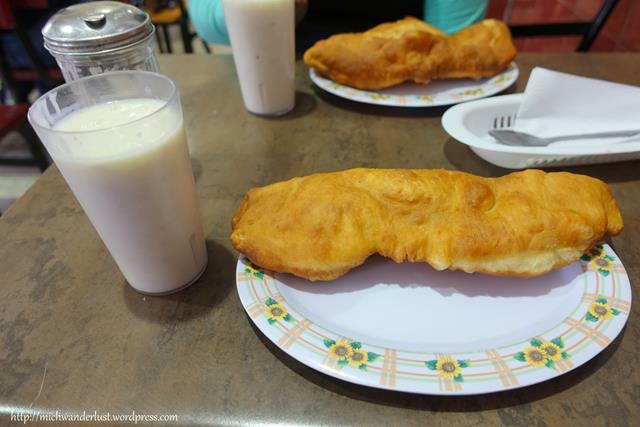 After strolling down a few blocks, past shops selling spices and sweets, we took a quick break and had empanada con morocho. I could wax lyrical about these empanadas – but wait, I already have! This could be an entire meal by itself. I was quite full from lunch so I could only eat a few bites. Such a pity! Pro tip: Come here with an empty stomach. You won’t regret it. A few minutes’ walk south then took us to this square with a fantastic view of El Panecillo. There appeared to be a fire on the other side of the hill. We could see (and smell) the smoke, but everyone seemed quite sanguine about it. Apparently fires are quite common during the dry season (which is now). It’s nothing compared to the annual haze we get in Singapore though! 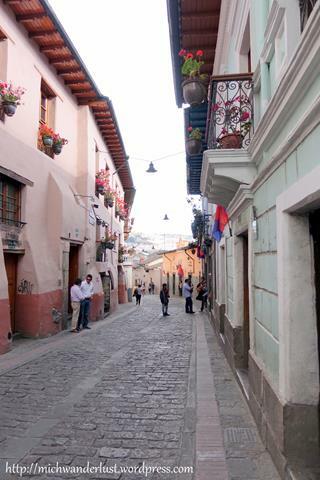 One of the most famous streets in Quito – it’s picture-perfect, isn’t it? There are tons of shops, restaurants and bars here. Although it was quiet when we visited (at about 4pm), it really comes alive on Friday and Saturday nights. 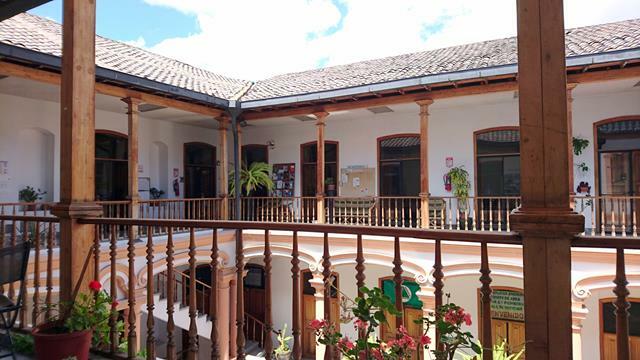 Look out for the placards on the walls telling you a bit more about the history of this area and those who lived here (many famous Ecuadorean artists, writer and politicians). Thus ended my final cultural excursion with the school. I could have definitely saved money if I’d stayed in a hostel instead of a homestay, and foregone the cultural excursions. But I’m really glad that I opted for those. Living with a host family has really helped in terms of getting more Spanish practice. And their recommendations on places to go / things to see / precautions to take, etc. have been invaluable. Plus, I got lots of privacy (and my own room!). 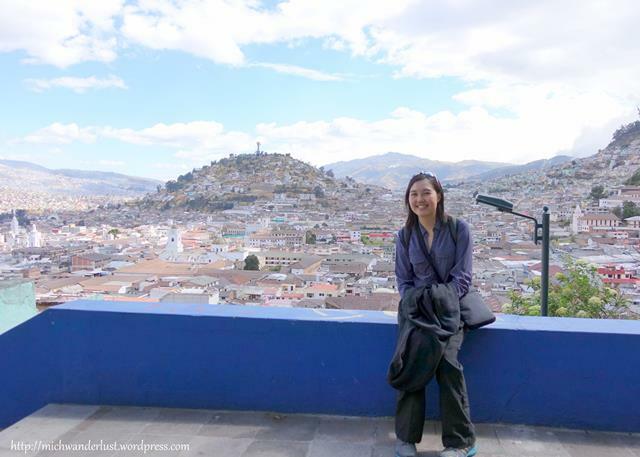 Likewise, I learned much more from exploring the city with my teacher-guides than I would have on my own, even if I were armed with a guidebook. So, overall I’m really happy that I chose this programme. I wish I could have stayed longer, but it would have really eaten into my budget, so I’ve made my peace with it. What an amazing way to explore the world. Thank you for sharing your adventures with us.